The Stacker, designed for children 6 months and up introduces 5 educational concepts. Colors ? each shape is one of six rainbow colors Shapes ? the shapes are a triangle, square, pentagon, hexagon, octagon, and circle Shape Names ? each of the shapes have the name of the shape engraved in the side Numbers ? each of the sides of the shape have a number engraved on the top ? triangle has 1-2-3, square 1-2-3-4 and so on. Patterning ? lightest to darkest colors, smallest to largest size The stacker also helps little ones work on their gross motor skills and provides wonderful tactile experiences. Made from solid hardwood maple, each piece is finished with water based dye stain colors and sealed with a non-toxic clear coat. 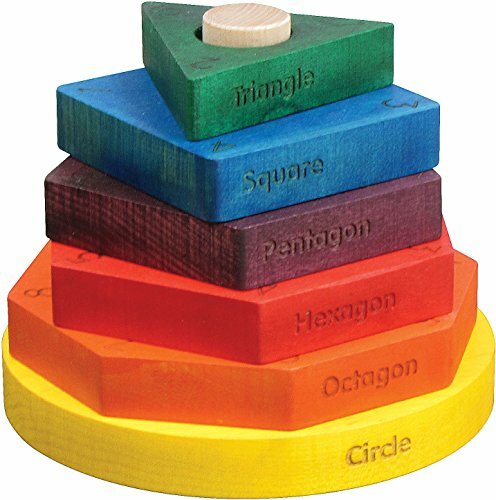 The entire stack measures just shy of 5÷ tall (each piece is 3/4" thick) and the largest shape ? circle is 5 1/2" across. The dowel to hold the pieces is a hefty 1÷ thick.